Luciano Berio died in 2003, and since then, the re-evaluation of his lifework has accelerated. Part of this re-evaluation includes recordings, and these two new entries in Deutsche Grammophon's "20/21" series defiantly seem to insist that Berio's music will transcend the culture that gave birth to them. 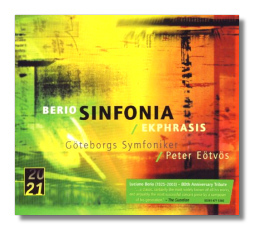 Before listening to this new recording from Göteborg (Gothenburg, Sweden's second largest city), I went back to Berio's own version of Sinfonia, recorded for Columbia Records with the New York Philharmonic and the Swingle Singers, shortly after the première. One drawback of the Berio recording is that it does not include the fifth movement, which the composer added later on. (To be honest, however, I don't think the fifth movement accomplishes its purported task of summing up and analyzing all that came before it.) One advantage to the Berio is that the Swingle Singers perform this music as if their lives depended on it. Sinfonia becomes a piece of musical theater on that recording. Unfortunately, no one has lived up to that standard – although Pierre Boulez came close in the 1980s – and the London Voices, aided and abetted by Peter Eötvös, favor subtlety over drama. As Berio approached death, he might well have appreciated that, but I will always have a special place in my library for the original LP (never reissued on CD, as far as I know). Compare both recordings in just the last minute of the third movement, and you'll hear the difference between head and heart. Ekphrasis (1996) was among Berio's last major works. (According to Paul Griffith's interesting booklet notes, the name refers to "the verbal representation of a verbal representation.") This is gorgeous stuff – slow-moving, richly hypercolored, and dense almost to the point of impenetrability. Clouds of sound form, melt into one another, and dissipate. There are no "themes," per se, but musical gestures that return from time to time as signposts to urge the listener forward. Over 18 minutes long, it is worth the price of the CD. Folk Songs, written in 1964 for mezzo-soprano Cathy Berberian (Berio's erstwhile wife), is a very different piece, but typical of another aspect of the composer's work. In it, he took 11 traditional songs from the United States (Black is the color, I wonder as I wander), France, Italy, and elsewhere, and arranged them for voice and seven instruments. While the arrangements are inventive, there's nothing outrageous about them. Also, Berio leaves the original melodies intact and is faithful to the cultural traditions represented therein. The most experimental aspect of Folk Songs is the juxtaposition of 11 disparate songs from various regions of the world as if they were flies frozen in the same piece of amber. (Berio includes two songs from the Auvergne region of France, and these will be familiar from composer Joseph Canteloube's collection Songs of the Auvergne.) Berberian's own recording of Folk Songs remains essential for anyone interested in this work, but Dawn Upshaw runs a close second in her willingness to approximate singing styles from places as different as Azerbaijan, Armenia, and Sicily. Argentine composer Osvaldo Golijov (b. 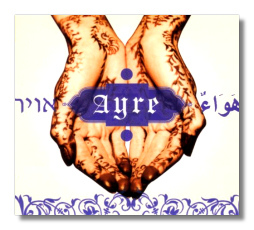 1960) wrote Ayre as a "companion work" for Berio's Folk Songs. As the son of Eastern European Jews, and a resident of Jerusalem for many years, Golijov was in a unique position to continue the multicultural discourse begun by Berio's work. As Berio wrote Folk Songs for Cathy Berberian, Golijov wrote Ayre for Dawn Upshaw, who had premièred several of his earlier works. The work is a mixture of new and old texts, and original and traditional melodies, seamlessly forming an organic whole. There are Sephardic songs and lullabies, Christian Arab Easter songs, and an 18th-century protest song from Sardinia. Upshaw sings the latter – if "singing" is the appropriate word – in such a way as to suggest that if performance artist Diamanda Galas ever needs to cancel a concert due to illness, she could call in Upshaw as a stand-in. Upshaw's performance throughout Ayre is a tour de force of singing (both "wild-eyed ranting" and more traditionally beautiful modes), recitation, and vocal acting. Like Berio's Sinfonia, Ayre is a piece of musical theater, and Upshaw realizes it beautifully. The so-called "Andalucian Dogs" accompany her with an idiosyncratic ensemble including a "hyper-accordion" and pre-recorded samples (a "beat box," crowd noises, and so on). So, although Golijov set out to write a companion piece to Berio's Folk Songs, Ayre turns out to be more reminiscent of the Sinfonia in its all-embracing little bit of this, little bit of that sensibility. Unlike the Sinfonia, however, it seems very dependent on the musicians who perform it here, so it will be interesting to see how Ayre will stand the test of time.